Chateaubriand Wednesdays Chateaubriand for Two - what better way to compliment the incredible views of downtown Edmonton and the beautiful Saskatchewan River valley! La Ronde has been serving and perfecting this meal for over 50 years now - so come and treat your significant other to a culinary delight they will never forget. Retro Thursdays Escargots . . Steak Diane . . Cherries Jubilee . . join us every Thursday in La Ronde restaurant for a special Table d'hote menu. Featuring the favourites of yesteryear which are sure to create memorable moments for decades to come. Exclusive of tax and gratuities. Downtown Edmonton's most popular breakfast location is sure to please. Book Cafe Lacombe for your own private dinner party up to 120 people. 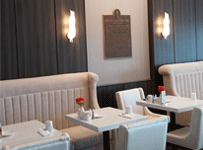 Cafe Lacombe offers a sumptuous full breakfast buffet. A quiet lobby lounge overlooking the river valley, open daily for lunch, dinner and cocktails. Bellamy's Lounge also offers sports coverage on its large-screen television.